Info | What Is New With NeoFinder? What Is New With NeoFinder? NeoFinder mentioned in MacObservers Geek Cab podcast! We are happy to report that MacObserver has mentioned the new NeoFinder in its rather geeky podcast Geek Cab. They explain why Spotlight is not working with external disks or network shares, and the situations in which NeoFinder comes in very handy! We are very happy about this nice mentioning, and we hope you enjoy it, too! 'twas 15 years ago today! 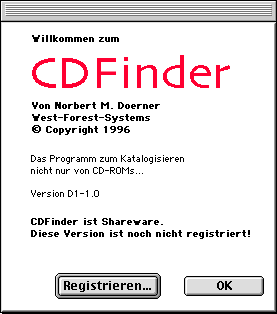 On a rather cold evening on December 5, 1995, chief developer Norbert M. Doerner wrote the first lines of code for a brand new Macintosh software called CDFinder. Little did he know that this new pet project of his would turn out to be a highly successful product that would still be actively developed 15 years later. For those technically interested, the first CDFinder code module was a progress window that showed the progress bar in color, which had to be manually drawn in 1995, because System 7.1 in that day only had a boring back and white progress bar. Yeah, those were the days. The first version was released in April 1996, and only in Germany. The first english version was 1.1 released in May 1996. We will definitely celebrate this amazing feat with a nice glass of Champagne tonight. Thank you very much to all these 49,000 people who have purchased a CDFinder license in the past 15 years, and who helped us make CDFinder such a cool product! If you are interested in geotagging, and you ask yourself if that is simply placing photos on a map, you may wish to hear the speech of CDFinder developer Doerner at the biannual photokina expo in Cologne, Germany. This free speech is hosted by the high tech forum SPECTARIS, and will take place on September 22, 2010, at 1:30 P.M. 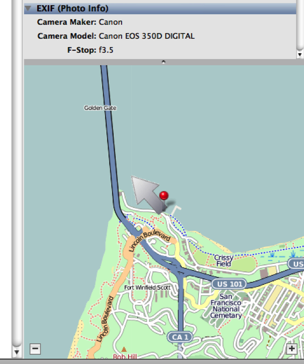 Together with Sebastian Hofer from http://www.gps-camera.eu you will be able to have a first look at the exciting new GPS features of CDFinder 6! We would love to meet you at photokina 2010! Next week, politicians from all over the world meet together to talk. And talk. And talk. And talk even more. The CDFinder team is sick of talking, and started taking action. The popular video production blog SuiteTake.com has just published a long article about archiving large amounts of video data created in any video production. "As each tape is filled, we mount it on the desktop of the computer and use a program called CDFinder to create a catalog file of all contents of the tape. This usually only takes a few minutes per tape. Once complete, the tape is in the CDFinder database and can be searched from any computer in the office without the tape being loaded. Once we find what we’re looking for, we load the appropriate tape and retrieve the files. It has turned out to be a great system."